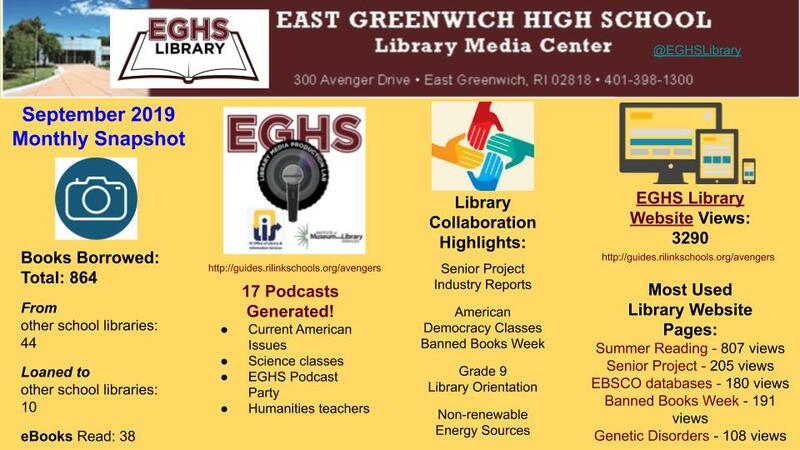 The East Greenwich High School (EGHS) Library is open to all East Greenwich students, staff and faculty. EGHS students, school district staff members, and parents can check out all items that are part of our regular circulation. The loan period is 10 school days (2 weeks). Limit: 3 items per student. When students have multiple research projects, they can request to borrow additional items. There are no overdue fines. You may come to the library to renew if you need additional time, or renew online by following the directions on this page. Please bring your items to the library when renewing. You can also email Mrs. Steever and ask her to renew your library items. You have an overdue book. Students must pay the cost of replacing lost or damaged materials before borrowing additional items. Check your school email address and/or "My Info" in your library account to check for due dates, overdues, fines, and hold status. Overdue notices are emailed weekly, and ready hold notices are emailed on the day that the item arrives. As a member of the RILINK consortium, the EGHS Library follows the consortium-level Interlibrary loan policy that is posted on the RILINK Website. Interlibrary loan requests can be placed by EGHS patrons independently when they are logged in or by library staff. The library is a place to read, research, study, and create. Students may work independently or complete small group projects quietly. Laptops, desktops and printers are available for academic work. Library expectations apply before, during and after school. Providing instruction to foster competence and stimulate interest in reading, accessing and using information and ideas. The EGHS Library embraces an open access philosophy. Open access means that students continue to use the Library on a regular basis to exchange books, receive guidance in selecting appropriate materials and use library resources.